I *heart* you, now take the damn quiz! ponder this . . . Babies – Why Are They Vulnerable? I’m reminded it’s extreme . . . Above, me geared up for a day of DH. 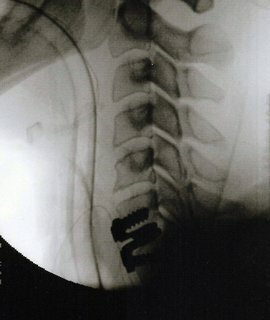 Below the x-ray (side view) of my new steel disc. I don’t often think of DH (downhill mountain biking) as an extreme sport, though I’m reminded that it is. Example: screaming down a mountain, clipping a tree at about 25 mph which sent me flying a good 20 feet to a rocky landing. Though I spent several hours in the trauma unit, I walked away for the most part unscathed. Sure, I’d needed a dozen plus stitches, had a road rash on an entire side of my body, was substantially bruised and got a black and blue eye (though wearing a full face helmet), I did walk away from it just fine. Later I found out that I was wrong and I was not “just fine”. Next, my knee. That too, a price to pay for the sport I love. And if you’re asking . . . yes, I will ride/race next season! Related posts: What We Do! Want to know more about DH, you’ll find great videos on youtube! What we do and where we were this past weekend . . . When time allows we are on the trails. 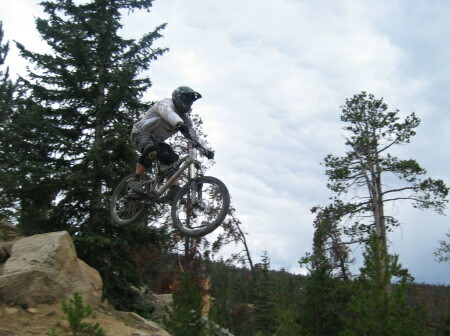 A good balance of cross country and downhill mountainbiking is my preference. My husband prefers to focus on technical rides and downhill racing. Unfortunately the summer passed so quickly that I’ve had very little time in the saddle this year and the weather is changing already. The hours that I invest on the spin bike would be more enjoyed on the trails; however, family, work and Stinky Couture™ have created a schedule that only a very disciplined and organized person could squeeze time from. Disciplined I am, but organized I am not. Below is a picture of my best friend, my husband, doing “what we do”.